The Newfoundland has a well deserved reputation, established over many years, as a saviour of people from the sea. 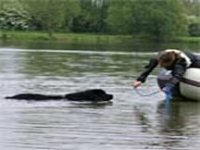 Without wanting to put anyone in danger, the present day owner increasingly wants to see whether the dog is equally capable in the water. This set of exercises, which will test the dog at 5 levels, has been devised in order to provide a safe and consistent method of proving the dog's capabilities in a non-competitive environment. Owners do not have to train only to these exercises or even for the tests. 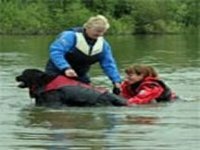 The tests have been designed to encourage the dog and owner to work together as a team. 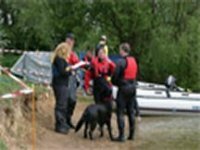 The complexities of retrieving are gradually built over different distances and a variety of objects so the dog will eventually carry out a directed tow/retrieve of a person in Section E Exercise 3. It must be understood that it is necessary to master the lower levels first in order to proceed to the higher levels. If a problem arises with a certain exercise or part of it then there will be a firm foundation to fall back on; if training is carried out inconsistently then a problem cannot be dealt with systematically. Thus dogs must pass each lower section before being permitted to attempt the next highest section, i.e. passing Level A & Level B before entering for Level C. It must be borne in mind that the exercises actually test the owner and dog partnership, not just the capabilities of the dog. On a test day there will be two Judges and it is their desire for all the dogs to pass. Entrants may ask them questions during the test if they are unsure whether they are permitted to do something or not. Judges may volunteer some advice to help entrants and their dogs during the first three test levels (A, B & C). The Judges will be using a scoring system for marking each performance. These marks are purely for their use and will not be divulged to entrants. The published results will only show whether the required standard was reached. The dog and owner must reach the required standard in each exercise otherwise they will fail the test as a whole. A dog can fail through losing too many points, performing a failure action or running out of time. At the conclusion of each test the Judges will inform entrants whether they and their dog have passed or failed and probably make some verbal comments. There will also be written comments to collect from the score steward, together with a certificate of competence for a pass. These tests are non-competitive. However, if a competitive trial, with dogs/owners being placed in order of competence, is being arranged then these regulations may be the basis for those trials. 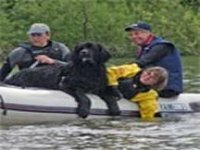 A test day is for entrants to have FUN with their dogs and delight in their joint achievements and those of fellow Newfoundland owners. Even at a test remember never to become so serious that the fun goes out of working for either you or your Newfoundland. Dogs must be at least 6 months old on the day of the test to enter for Section A, 9 months for Section B, 18 months for Section C and 24 months for Sections D & E. These ages have been set in the best interests of the dog, bearing in mind its physical and mental capabilities. Owners are encouraged to start training their dog when it is capable of performing all elements without undue strain.